My name is Jason Miller. I have 20 years of Sales and Customer Service experience. I am writing regarding a meeting I had with Jason Desaulniers, of Excalibur Executive Planning Inc., on February 7, 2012. Upon meeting Jason, this gracious father of three daughters, impressed me with his honesty and professionalism. He truly wears his heart on his sleeve. His more then 16 years of experience shone through as he guided me through a very important and confidential plan for my future. Jason is more then willing to listen to provide the correct plan for you and your family. It is with confidence that he can tell you what you need to know, not just what you want to hear. 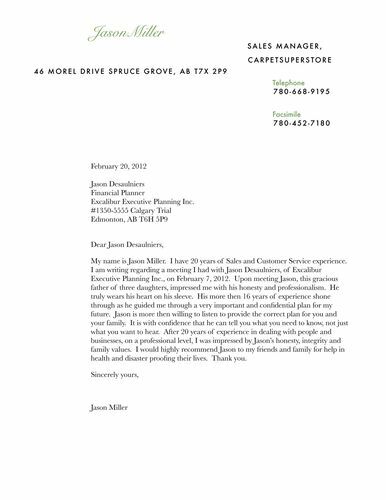 After 20 years of experience in dealing with people and businesses, on a professional level, I was impressed by Jason’s honesty, integrity and family values. I would highly recommend Jason to my friends and family for help in health and disaster proofing their lives. Thank you.